If there’s an animal which we associate with being put on a leash and taken for a walk, it’s a dog. Cats are a little more independent than dogs when it comes to going outside. You can usually allow them free to wander around, and they’ll come back to you when they’re tired or bored. Sometimes, though, it’s useful to be able to take your cat on a longer adventure. That might just be to help exercise an obese cat – especially one that doesn’t exercise voluntarily. Alternatively, it might be to take your cat on a walk to the vet, or somewhere else it needs to go. That’s where a good cat harness comes in. There are other uses for a cat harness, too. If you’ve recently moved house, a supervised walk can help your cat to get to know its new neighborhood. A few walks around the local area on a cat harness will teach your cat where and what all the new sights and smells are. It can familiarize itself with its new surroundings without the fear of running off or getting lost. If that sounds like it would be useful to you, read on and we’ll tell you everything you need to know about choosing a great cat harness for your pet! Why Would You Use A Cat Harness? To cut a long story short, it’s the safest way for your cat to move around outdoors. Many people reading this article will have a house cat. That might be because you have an older or nervous cat. If that’s the reason, that’s fine. There’s no need to drag your cat outdoors if it doesn’t want to go! For many of you, though, it will be because you live in an apartment. That means you don’t have a yard or garden, and you can’t just let your cat outdoors to run around. It’s not practical to head to the apartment entrance, open the front door and wait for them to come back either. With a cat harness, you could leave the apartment with your cat on a leash, take them for a good healthy walk, and bring them back home safely. It could open up a whole new world of exercise for your cat. Having cat furniture at home for them to exercise on is all well and good, but nothing beats a walk in the fresh air! There are some risks of going outdoors for cats when you’re not around. Sadly, there’s a reason that house cats live longer than cats who go outside. There’s the risk of getting into accidents with cars. There’s also the risk of contact with other cats. That can mean contracting a serious illness like feline leukemia or feline immunodeficiency virus. It could also mean getting into a fight and developing physical injuries. Your cat may naturally wish to wander freely, but the honest truth is that it’s safer by your side. Although a cat might initially resist being fitted with a harness, they can be persuaded with the right handling and training. A healthy, happy cat lives longer, and that’s what we really want for our pets. You might have taken your cat for a walk on a leash before, and wondered what the point of a harness would be. After all, there are cat leashes on the market which just clip to collars, and achieve the same thing. Aren’t they essentially the same thing? Well… yes and no. You can take your collared cat for a walk on a leash, but it might not be the best thing for your cat. It also might not be the best thing for you. Any collar – even a safety one – presents a choking hazard when attached to a leash. A collar is designed to fit tightly around your cat’s neck. That means when you pull on it – or it pulls on you wanting to walk further away – it tightens. That leaves your cat at risk of getting hurt, and likely to become stressed. A harness fits around the torso as opposed to the neck, and so eliminates this risk. Your cat also can’t break free of a harness. We’ve come across many stories of owners taking cats for a walk with a safety collar and a leash, only to be left holding an empty collar when their pet has wriggled free of the collar and run away! 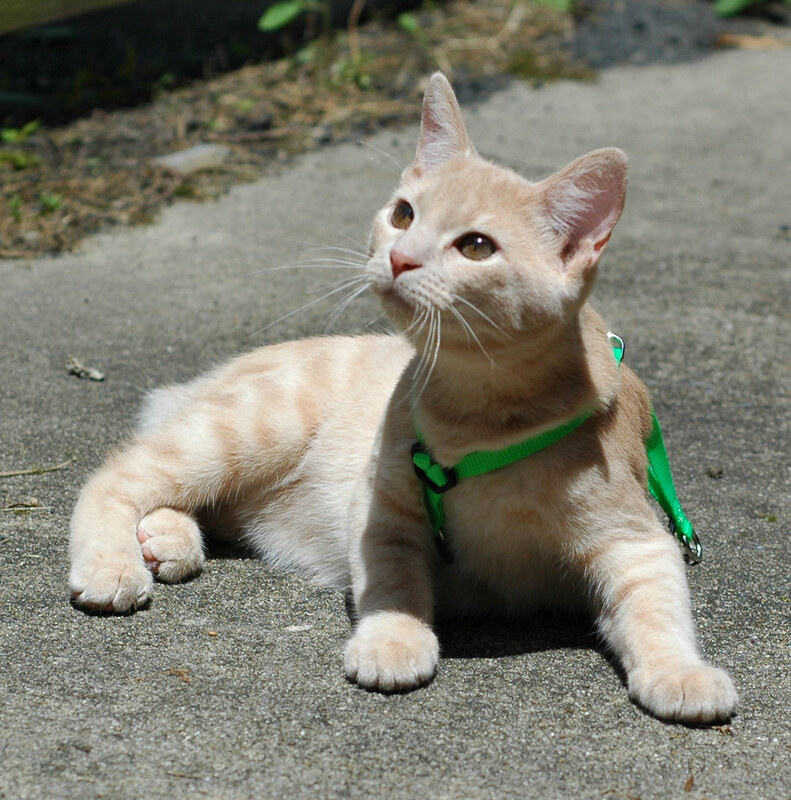 When it comes to safety and security, a cat harness has a cat leash beaten all ends up. What Is A Cat Harness Made Of? There are a few materials that a cat harness can be made from. The most popular three, though, are cotton, leather and nylon. Just as with buying clothes for yourself, leather is the most expensive option. You don’t have to worry about paying extra for a leather option though, because we don’t recommend it. Leather is the heaviest, least flexible and most potentially abrasive of the materials on offer. You can choose to buy a variant which has an internal lining of a softer material. That gets rid of the comfort issue, but it’s still heavy and potentially too warm. You don’t want your cat to be walking around feeling like it’s carrying a shell. It should feel as free as possible in its harness, and leather won’t achieve that. That leaves cotton and nylon as your remaining primary options. Either one would be fine, but if we had to choose on we’d go with nylon. It’s a more resilient material, and will cope with stress and strain better than cotton will. Perhaps more pointedly, it’s also more likely to put up with scratches and bites from a cat who’s trying to get rid of it! The appearance of a cat harness can vary from brand to brand. For the main part, though, they divide easily into one of three categories; Figure 8 Harnesses, V Harnesses and H Harnesses. Those are the ones we’ll focus on here. This is the most common type of cat harness. It’s also the cheapest and the most simple. We don’t mean those terms as an insult – sometimes the cheapest option really is the best. A figure 8 cat harness comprises of two circular pieces of material. One goes around the torso of your cat, and the other goes around the neck. They join together behind your cat’s neck, where you secure the harness and then attach your leash. Simple and effective. In this case, ‘V’ stands for ‘vest’. We’re not sure that’s actually why they’re referred to as a v harness, but it makes sense and so we’re going with it! This is more like a full body jacket for your cat. It completely surrounds their torso. That makes them snug and secure, and gives you total control over your cat’s direction. While this is, on paper, the safest option, it may also be the hardest one to persuade your cat to accept. If you’ve ever tried to wrap your cat up in a towel, you’ll know what we mean by that. Cats love to be naked. Even a collar is too much for some of them. Putting a v harness on them is basically asking them to wear a miniature coat. You may have better luck with one of the other types! Of the three types, this strikes us as the best compromise option. It has more security and strength than the figure 8 harness, but is made of less material than the v harness, so your cat will likely be more open to it. To look at, they’re visually similar to the figure 8 harness, in that it’s two loops of material. What marks an H harness out as different to a figure 8 harness is one additional strip of material. The strip connects the loops together, creating a letter H shape on your cat’s body when they’re wearing one. That means less pressure on your pet’s neck. A harness automatically exerts less pressure than a leash and collar to begin with, but an H harness reduces the pressure down even further. Ah, yes. The fun bit! As with introducing anything new to your cat, the key is to be patient and move slowly. Most importantly of all, let your cat take the lead. Do not, under any circumstances, try to put your harness on your cat as soon as you’ve bought it. Your cat will resist, instantly develop a negative relationship with the harness, and likely reject it out of principle in future. Let Them Have A Good Smell! Cats trust their noses more than any other sense. The first thing they do when something new comes into their home is cautiously sniff it. From that, they’ll determine whether it’s a threat, and whether they’re comfortable around it. Therefore the best approach is to remove your harness from its packaging, and leave it on the floor somewhere your cat spends a lot of time. Let them smell it, poke it and prod it and generally get used to it being around. When they no longer find it interesting (because it doesn’t move and they can’t eat it! ), place some of their favorite foods or treats near it, so they have to come close again to eat. That will get them used to being in close proximity to it. After a few days, rub the harness on their preferred blanket or cushion so that their own scent gets on it. That should sell your cat on the idea that it’s safe, and poses no threat to them. If all has gone well, it’s time to try taking your cat for a walk. Don’t go outside yet, though. The combination of the harness and the outside world at once might be overwhelming. Instead, clip the harness on and walk them around the house. Again, don’t pull on them. See how they react to being in the harness first. If they just want to sit, sit with them. Even just wearing the harness and not being bothered by it is a positive. Eventually, either through curiosity or need, they’ll get up and walk. Walk with them gently, taking care not to put too much pressure on the harness at first. A good idea would be to put the harness on just before they’re due to eat, and then walking them to their food bowl. That will build a positive association even if they’re not overly impressed with the cat harness. When you and your cat are used to touring your home together, and your cat has become accustomed to taking instructions by a slight tug on the harness, you’ll be ready to go outside. There’s no right or wrong time for this. Some cats will get the idea in one week. Others may take two or three. They do all get there in the end though, so long as you perform the training slowly and calmly. That’s it – so long as you’ve followed the above instructions, you and your cat should be looking forward to a whole new kind of outdoor living! Enjoy it! We hope our advise on how to choose a good cat harness was useful to you. We have plenty of guides on cat behavior and cat products across the rest of our site, so we’d like to think we have information on any cat training issue you could wish for. If you think we’re missing anything, let us know and we’ll see if it’s something we can help with! If you’ve benefited from this information, please consider sharing this page with your cat loving friends.